We began reporting voluntarily on our environmental and social performance with the first Shell Report, which covered 1997. We follow a content selection process to identify the most material topics for our reporting (see “Content selection process”). We provide regular information to the Carbon Disclosure Project, Dow Jones Sustainability Index, FTSE4Good Index and other organisations that assess the economic, environmental and social performance of companies. Internal controls such as audit trails and statistical checks help assure the accuracy of the Shell Sustainability Report. The External Review Committee of independent experts helps make sure our reporting is balanced, relevant and responsive to stakeholders’ interests. Lloyd’s Register Quality Assurance Ltd has provided limited assurance of our direct and indirect greenhouse gas emissions data for 2013. We report in accordance with the Global Reporting Initiative (GRI) and in line with the oil and gas industry guidelines developed by the International Petroleum Industry Environmental Conservation Association (IPIECA), the American Petroleum Institute (API) and the International Association of Oil & Gas Producers (OGP). 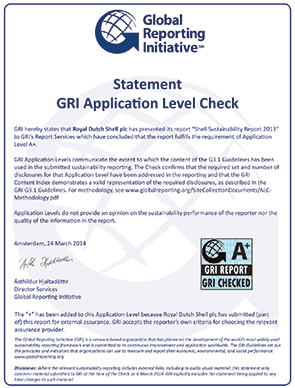 GRI confirmed our A+ reporting level for the information contained in this Sustainability Report, the Royal Dutch Shell plc Annual Report and Form 20-F for 2013, and on our corporate website. The GRI content index is available on our corporate website. Shell supports the UN Global Compact and its 10 principles covering human rights, labour, environment and anti-corruption. Sections of this Sustainability Report cover Shell’s performance in 2013 in these areas. This report is supported on our corporate website by more detailed information on Shell’s approach to sustainable development.